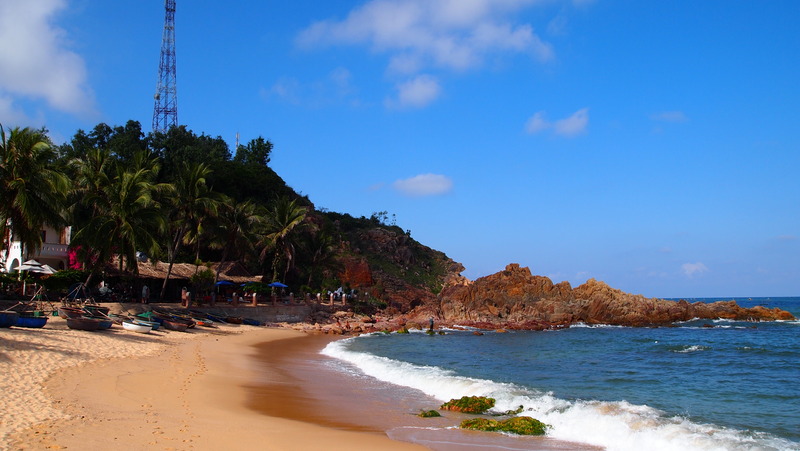 The next day, we headed north to the more central Quy Nhon area, which was recommended to us by our friend Tho from Hanoi. Instead of staying in Quy Nhon, we booked a room about fifteen minutes south of Quy Nhon in a tiny, local fishing village called Bai Xep, and it was one of the best experiences of our entire trip, despite the grueling journey to get there (7 hours in a 15 seater minivan filled with 30 people and all their luggage — seriously! I counted! — with no air conditioning, so windows were rolled down and we were covered in a not-so-fine layer of street dust at the end). Gotta love public transportation in Southeast Asia! Our little hotel, Haven, was situated in a small cove behind the fishing village, looking out to the sea and a vast, uncountable blanket of fishing lamps reaching far out into the ocean. The area was perfectly secluded and more peaceful and wonderful than we had hoped for. 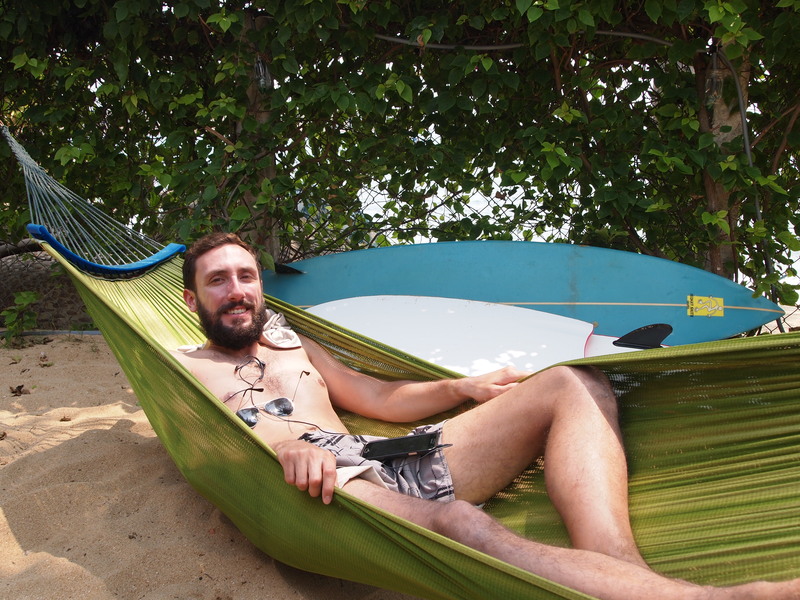 In fact, despite having to stay at the backpacker’s hostel (owned by the same people) next door, we extended our stay because just loved the cove and village so much. We met some wonderful people during our stay here — Greg and Jade, the Aussies who reside in London; Karl, a wonderfully colorful Liverpudlian with wildly colorful stories from his work as in the police force; Kiem and Thi, the two fisherman who spoke no English who befriended us and took us snail diving; and Le, the sassy 14-year old who showed us around the village. 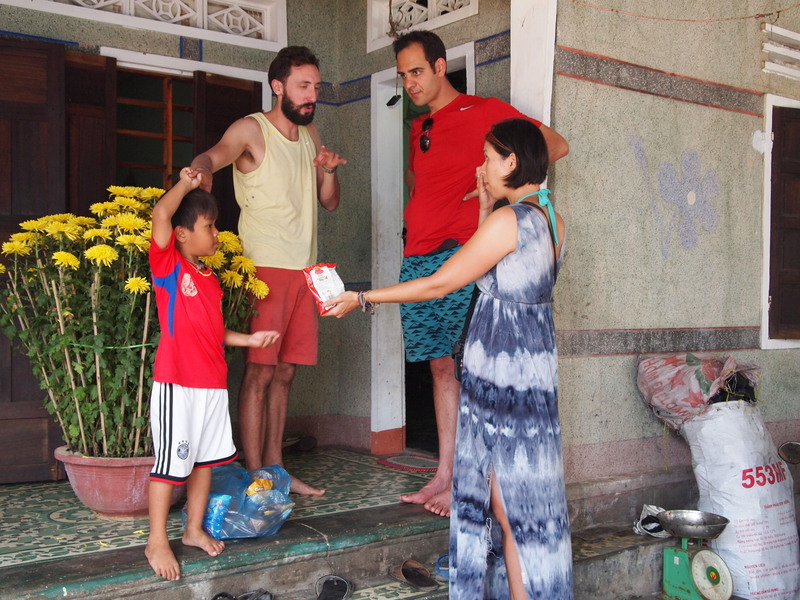 Walking through the village, we made friends easily, since everybody was curious about Mitch’s beard and then became explosively excited to hear I have a Vietnamese background, haha! Nearly everyone in the village made their living from fishing. 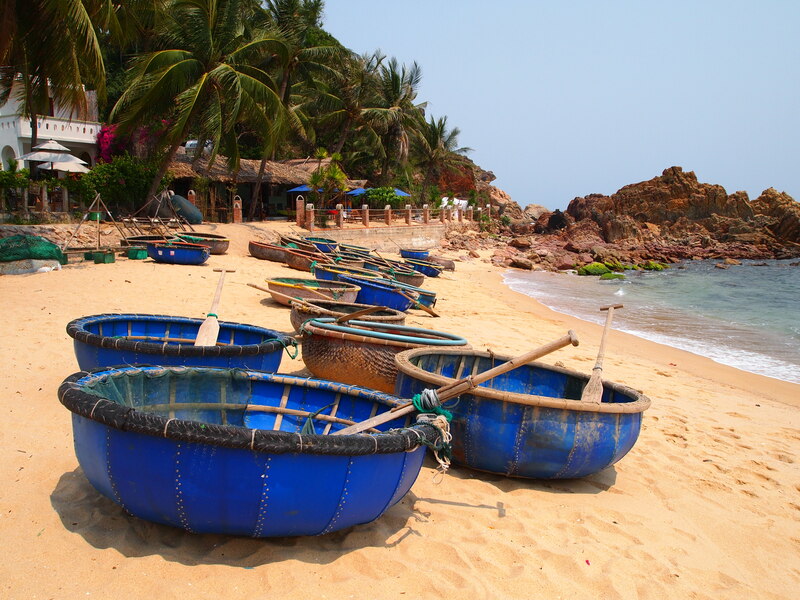 The shores of our little cove were lined with traditional Vietnamese row boats, which looked like large buckets powered by one oar. A bit off the coast floated many colorful fishing boats which were reachable by using the bucket boats. As I mentioned, farther out to sea, we saw hundreds and hundreds of lights fixed at the top of pyramidical, wooden structures about four or five feet tall. These lights turned on at night to attract squid, which the fisherman then caught to sell and eat. Bucket boats! These boats with single oars are what the fisherman used to paddle out to their fishing boats. Mitch enjoys the hammock outside of Haven. 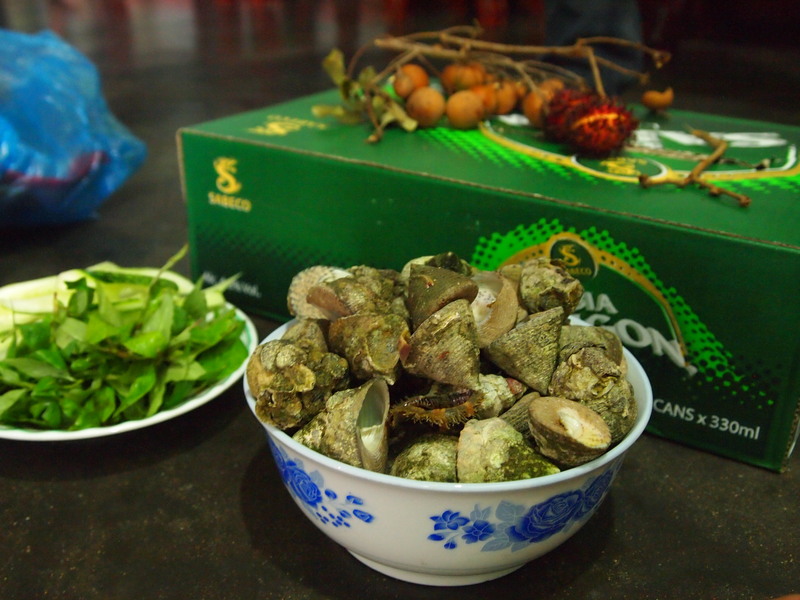 We were invited by our village friends Kiem and Thi to go snail hunting one morning, which was an incredibly interesting experience. We hopped in the traditional bucket boats and rowed out to Kiem’s fishing boat, which we anchored near an island. Kiem and Thi — who were expert snail hunters — donned their goggles and their breathing devices. By breathing device, I mean they attached one end of at least 50 meters of tubing to a generator pump and tied the other end around their waist with enough on the tail end to reach their mouths. The pump just pushed air through the tubing, so while under water, they’d exhale into the water and then use the tube to get more air. Kiem and Thi stayed under water without surfacing using this technique for an hour! Since Mitch and I were just holding our breaths and diving, we couldn’t hunt as deep into the water and we became tired much more quickly, but it was so fun! 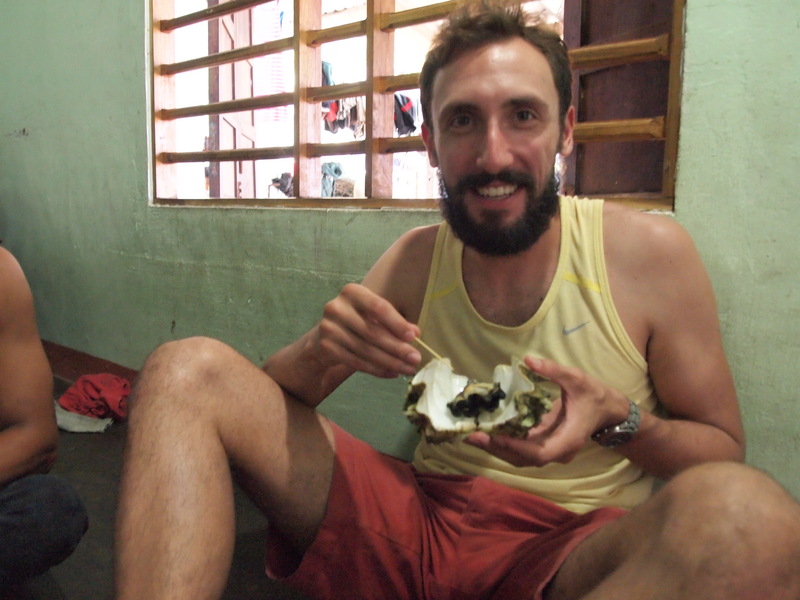 We enjoyed the fruits of our labor on the floor of Kiem’s home with a handful of townspeople as well as Greg, Jade, and Alex, the owner of our hotel who was also friends with the local villagers. Mitch, Greg, and Jade hang out in front of Khi’s place before our snail feast. These are the snails we found! 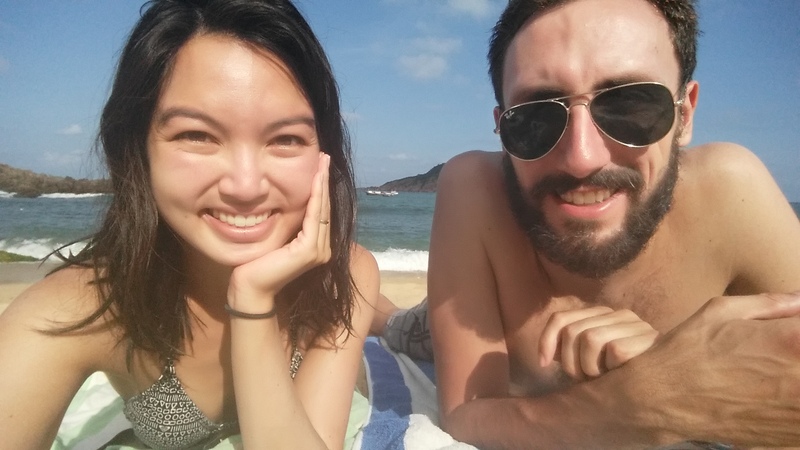 In addition to our snail hunting and other adventures, Mitch and I were able to spend a good deal of time unwinding and relaxing on the beach. The scenery in our little cove was indescribably peaceful and calming yet full of vibrant colors and life. Originally, we had only booked three or four days at Haven, but throughout our stay, we heard whisperings of some sort of fishing festival that was to take place after we planned to leave. So we booked two bunk beds in the hostel next door and extended our stay in Bai Xep. On the morning of the festival, we and our fellow travelers woke up at 6am in order to observe the beginning of the festival in the town temple. Something must have gotten lost in translation, since the only thing happening at the temple was a breakfast feast for a bunch of men. 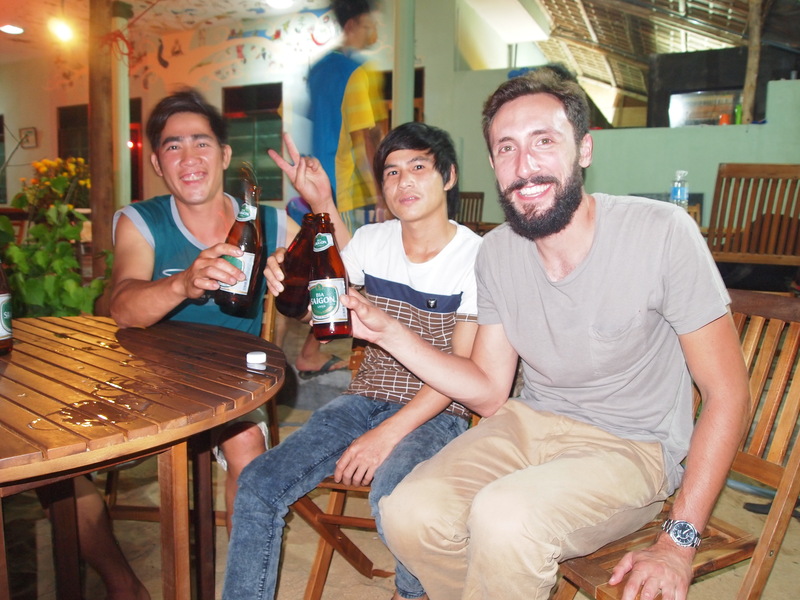 We were disappointed about missing the festival, but the men invited us to eat with them and then peer-pressured Mitch into downing six shots of rice whiskey… at SIX A.M.! Luckily, we found out the festival was actually later that evening in a small town about fifteen minutes away. Upon arriving there, Mitch and Greg were instant celebrities (being tall and white), and the children swarmed us, showering us in glitter and laughter. We walked around the festival (which included a stage, tons of street food, and games), stuffing ourselves with the amazing grilled quail. Karl enjoys some grilled quail while lightly dusted with glitter, haha! We were so sad to say goodbye to Bai Xep and all of our friends, but there were new places to see and people to meet! 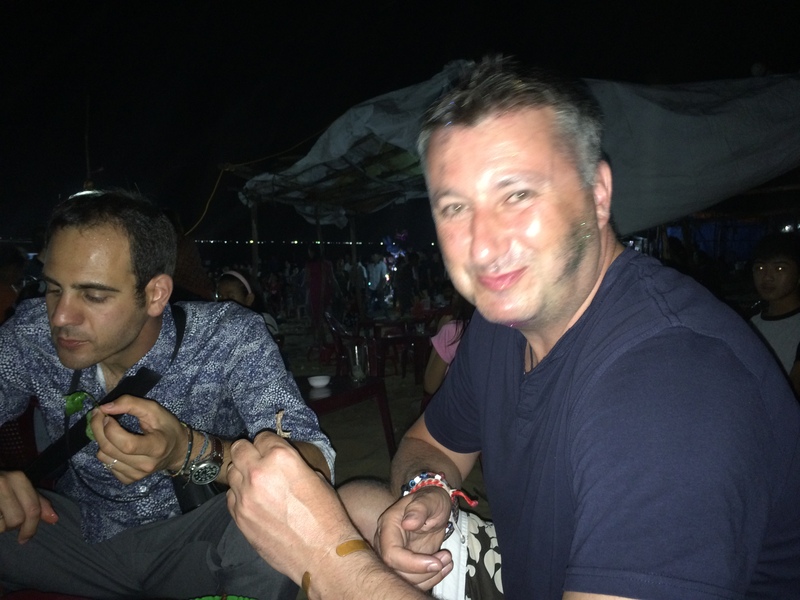 We will never forget our time in this sleepy fishing village or the wonderful people we met! Kiem, his brother, and Mitch have a drink on our last night. 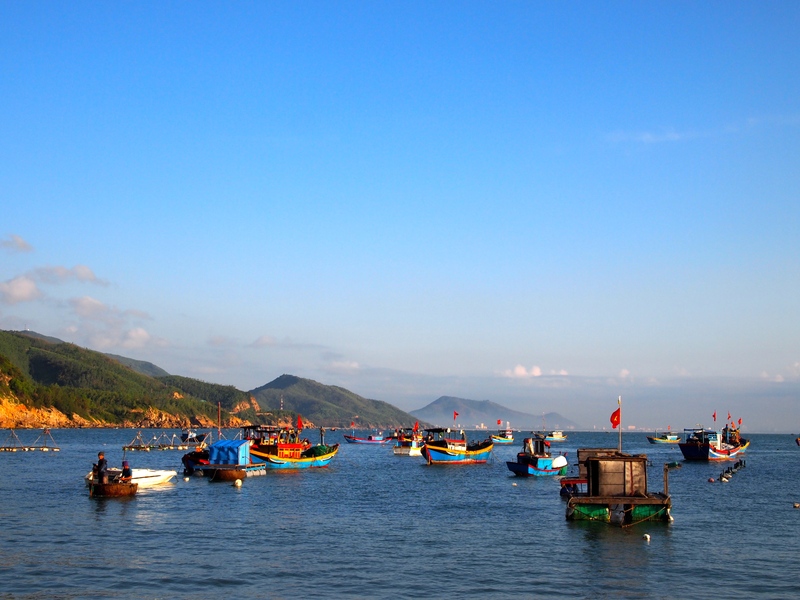 ← One Day in Nha Trang!